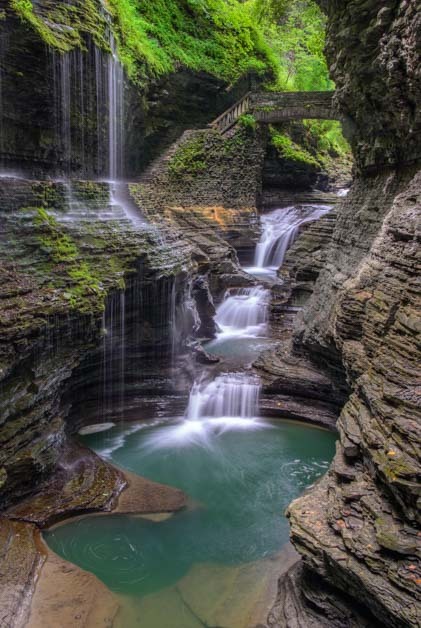 Watkins Glen State Park NY - Absolutely Breathtaking! 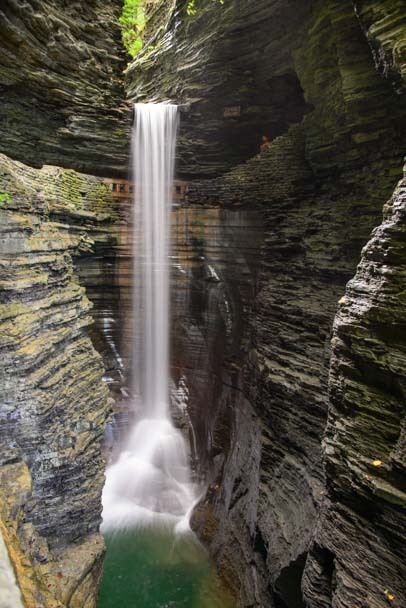 Watkins Glen State Park NY – Absolutely Breathtaking! 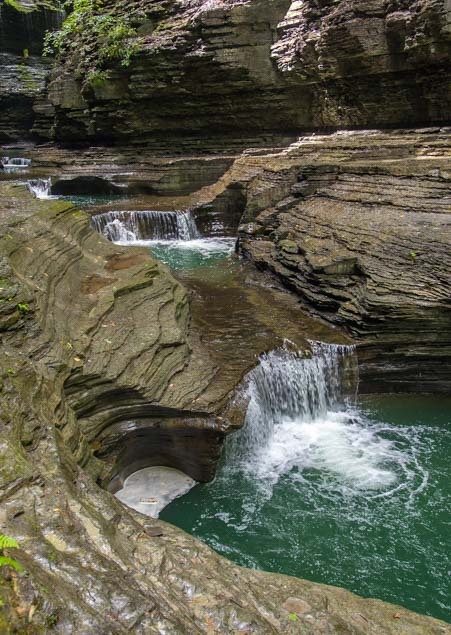 August 2015 — During our stay in the beautiful Finger Lakes of New York we enjoyed several weeks of thrills in August. 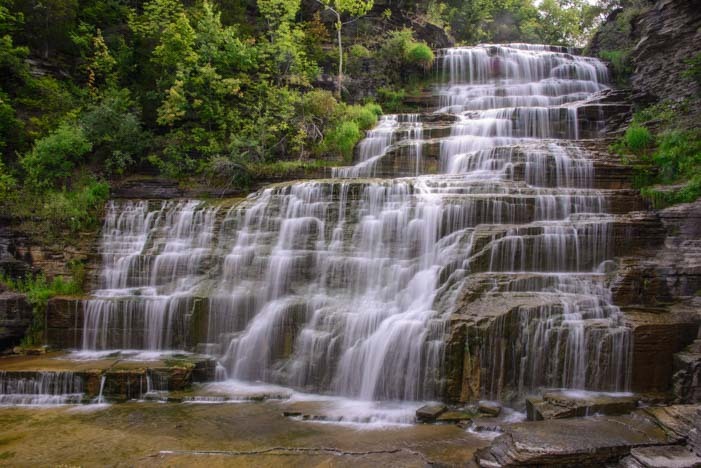 We enjoyed watching the Amish families in their horses and buggies and we discovered lots of waterfalls at the south end of Seneca and Cayuga Lakes. 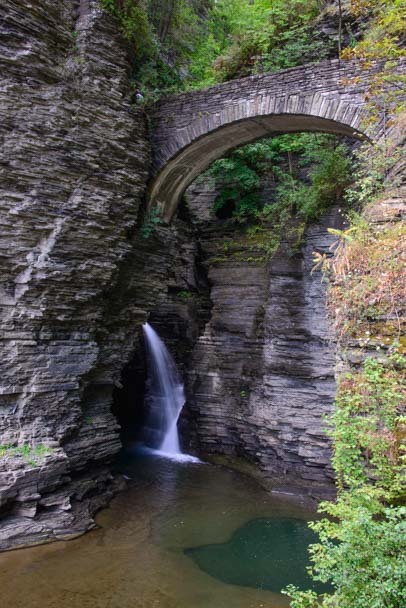 One day we decided to set off and see the mother lode of them all at Watkins Glen State Park. On our way there, we both noticed a waterfall out of the corner of our eye as we zipped by. It was Hector Falls, and Mark brought the truck to a screeching halt so we could see it up close. 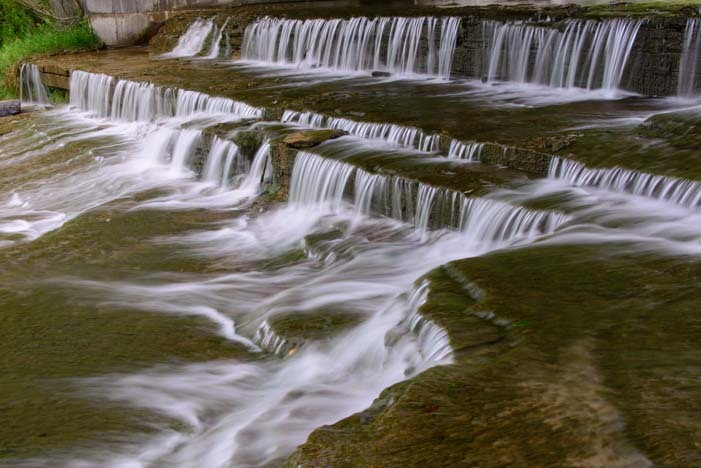 What a beautiful waterfall. It is right by the side of the road, and it even slips underneath the highway below a bridge where it stair steps down a series of wide, flat shelves. Stair steps of waterfalls beneath the highway at Hector Falls. 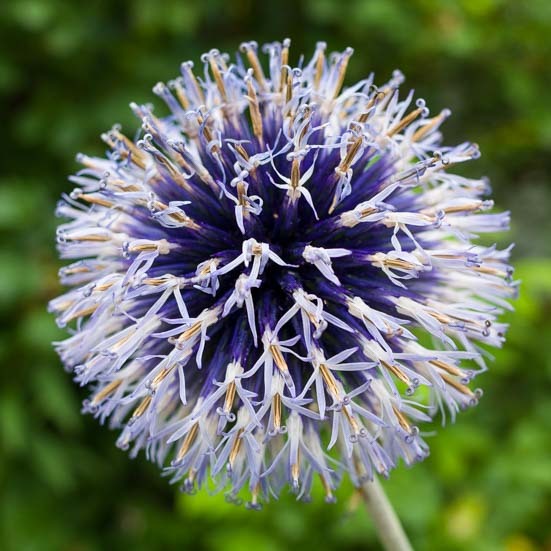 Mark spotted a beautiful flower growing in the underbrush too. 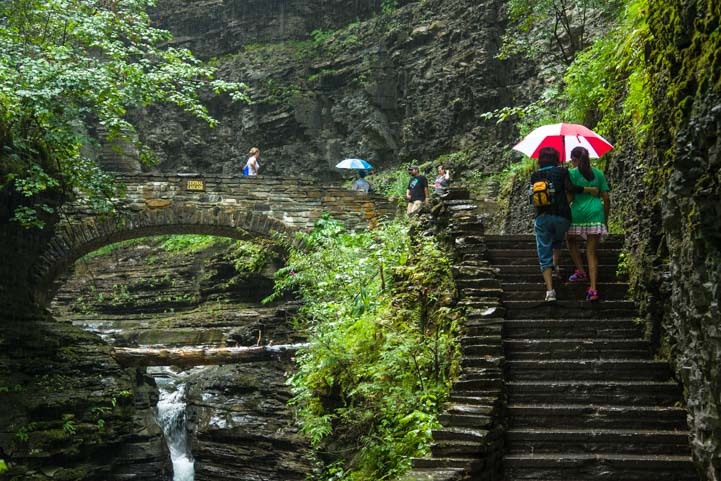 When we got to Watkins Glen State Park, the skies began to threaten. 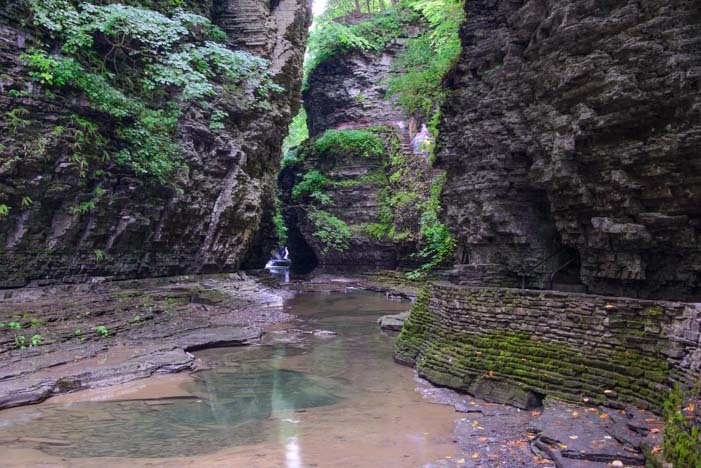 But we forged ahead anyway, walking along the Gorge Trail that follows the carvings made by Glen Creek in the soft sedimentary rock. Almost immediately, we found ourselves in a fabulous canyon filled with a pretty waterfall with a stone bridge crossing the creek. and stone bridge right off the bat! The heavens decided not to spare anyone on the trail that day, and a deluge soon fell. Savvy New Yorkers had come with their umbrellas. They know how unpredictable the weather can be. We had our ponchos, but they were hardly enough, so we hunted for rock overhangs here and there, crowding in with other hikers to find whatever protection we could as the rain fell in buckets. The heavens opened up repeatedly during our hike. Now and then the rain subsided and we could make our way further down the trail. The canyon walls fell away for a while and the creek flattened out into a beautiful mirror that reflected the thick green foliage around it. There were waterfalls everywhere, big and small. 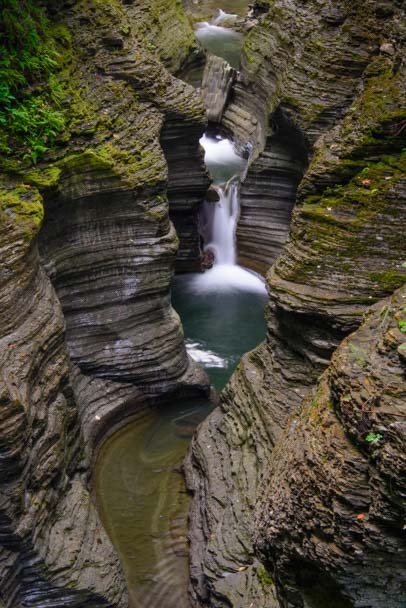 Water spills over the rocks. The waterfall at Cavern Cascade was tall and straight. This one was lots of fun because the trail went behind it! 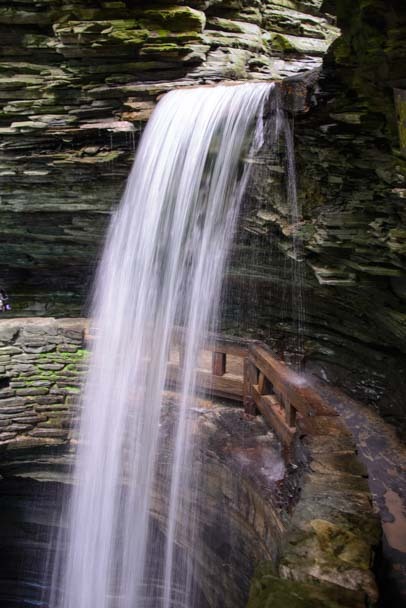 Cavern Cascade is a dramatic vertical drop! behind several other waterfalls too! The lush foliage and flat creek lured us forward until the rains came again. Serenity between the wild falls. This time it was quite a downpour, but somehow we found a spot to hide and stay relatively dry. 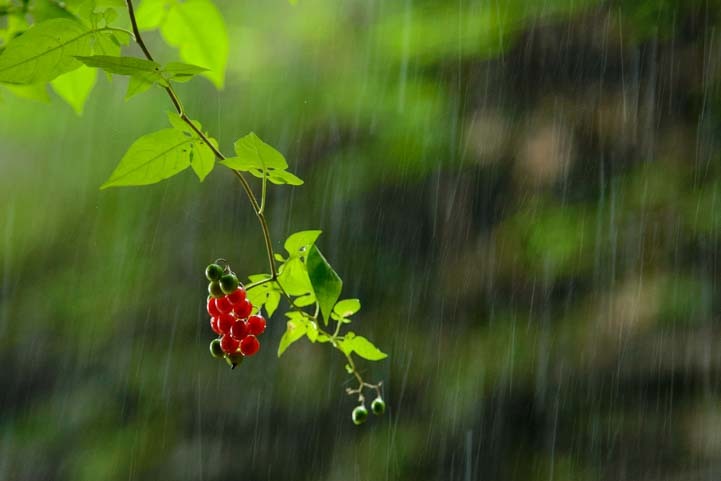 Mark looked up and saw some berries hanging on a branch and got the most creative image of them with the rain streaming down behind them. Looking out from our hiding spot along the rock wall, Mark sees a wonderful photo op! Once the rains released us — and all the other hikers that had been tucked against the sheer rock walls with us — we followed the trail as it snaked along the most spectacular curves of a narrow canyon. 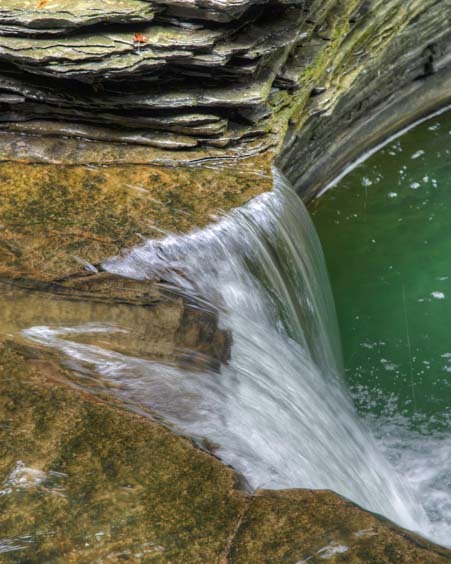 The rocks had been expertly cut by the creek over millions of years, and small waterfalls fell into crystal pools right next to our path. The waterfalls fell in cascades. If we had been frustrated by the rain two minutes before, we were imminently grateful for it now, because there was no sunshine to make hotspots of light on the rocks. We were so fortunate to have a day with brooding skies, rain and all! The dull, flat light created by the black skies was absolutely perfect for our photos. Rainbow Falls let loose a fine stream of diamonds up top. The heavy downpours made the water run faster too. At Rainbow Falls the thin strand of diamonds falling from the highest rocks was absolutely stunning. 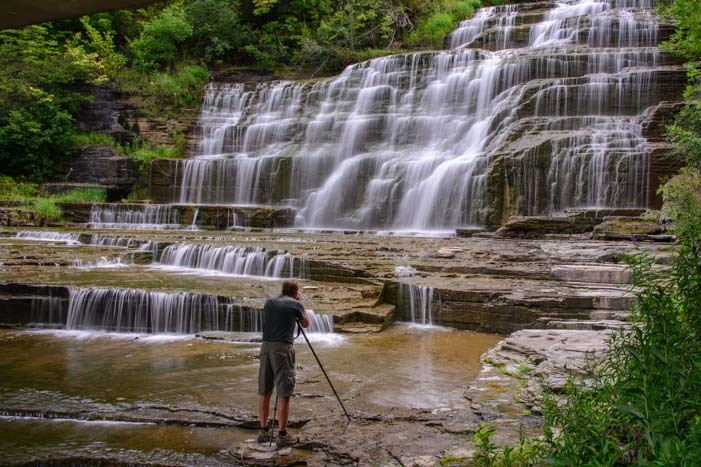 We were in awe that Watkins Glen was such a jewel in the Finger Lakes, and my jaw dropped as I saw the photos taking shape on the back of my camera. on the back of my camera! 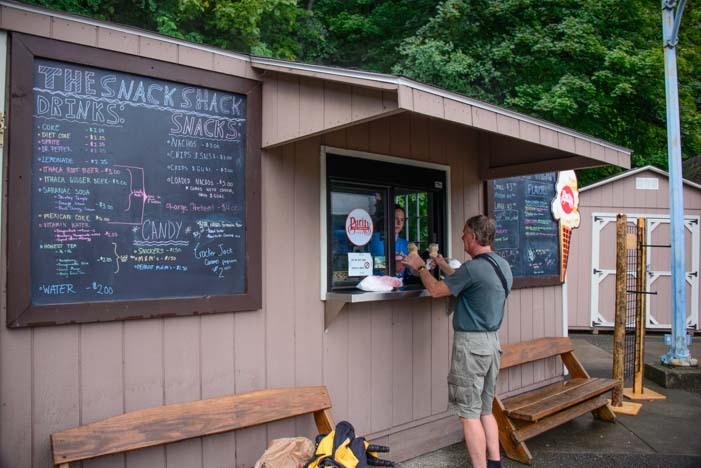 Afterwards, flushed with excitement, we stopped for an ice cream cone at the Snack Shack. The rain was still falling, but a little cupola near the state park entrance was a perfect hideaway. We ate our cones in utter contentment. What a special place — and what a special day! Wet, tired and incredibly happy, we capped a perfect day with an ice cream cone. 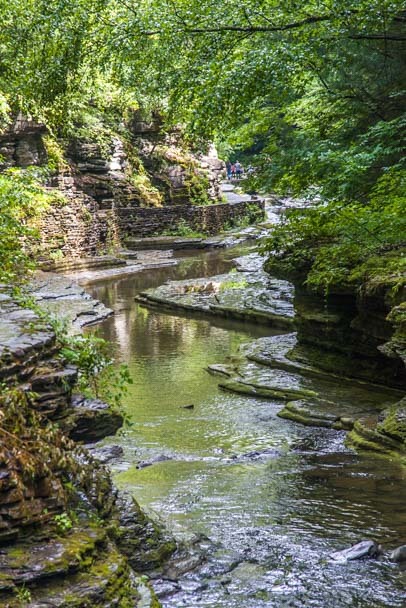 The New York Finger Lakes are a wonderful area for an RV road trip, and Watkins Glen State Park is truly a “must see” destination while you’re there. 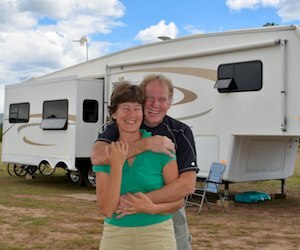 For RVers headed that way, our links below might help you plan your travels. 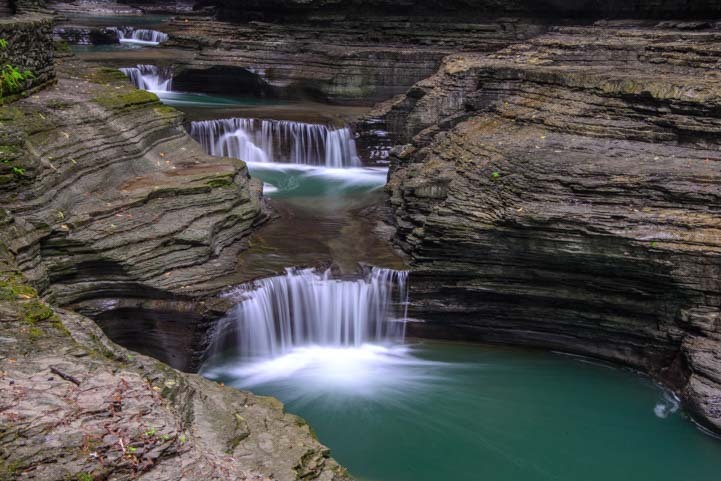 Places we’ve been that have beautiful waterfalls! 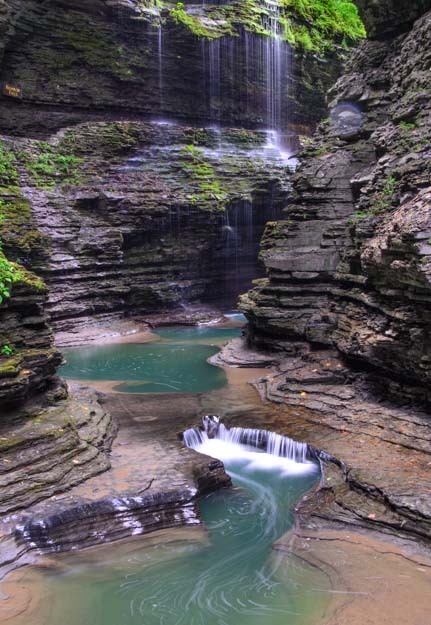 This entry was posted in New York and tagged Finger Lakes NY, New, New York, Travel, USA, Waterfalls, WP Travel by Roads Less Traveled. Bookmark the permalink.